Take your old tires and make chairs out of them. This setup is perfect for spaces in the garage or backyard. If you decide to put them inside, you can cover them with fabric to make them more suitable for your home. 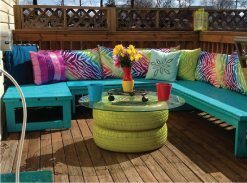 Two used tires, fabric if you want to cover them, wood pallets, a drill, a stapler, and some spong-es. Tire tables are great for basements and garages, although you will still want to clean the tire first (even if you won’t be eating off of it directly). Making a tire table is very similar to making a tire ottoman, except the rope will not cover the top part. Tires, nuts, and bolts, screws, drill, 1/2″ thick plywood, rope, stapler, glue. Paint your hubcaps and make them into beau-tiful garden decorations. The best part about this project is that it is incredibly easy, and you can add beads or other add-ons to make them even more fun. 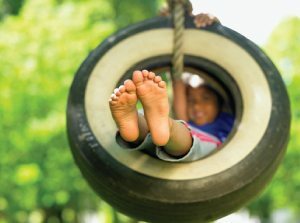 Every child loves a tire swing. If you have a tree in your backyard or another per- fect place to hang a swing, give them an awesome gift by hanging up your old tire. Tire swings can be purchased, but using your old tire and making one your- self is more fun and less expensive. Check out this video to learn how to hang up a tire swing in your backyard. 20-foot length of rope, a tire, and a sturdy place to hang the tire. Put your feet up and relax with a rope-covered tire ottoman. This DIY idea is easy and is a great use of your old tires. The only problem is whether or not your cat will think of this as his personal scratching post. A tire, 6mm MDF boards that are cut into two 55 cm diameter circles, a screwdriver, six screws, a drill, a hot glue gun, 5kg long and 10 mm thick natural sisal twisted cord, scissors, a cloth, and a concentrated brush sealer. 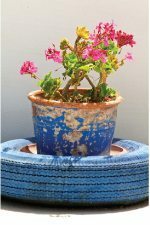 Tire flower pots look great in a backyard and are a good way to make use of your old tires. This video takes you through the steps on how to make your own. Add in your favorite plants, and you will have a beautiful decoration for the backyard. 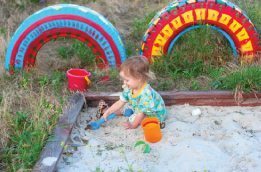 Every child needs a sandbox in their life, and it’s achievable if you have an old tire laying around. Make a fun sandbox for your kids with this simple tutorial, and bring the beach to your own back- yard. A tire, paint, reciprocating saw, pool noodle, old sheet, sand, plywood. Fido needs some love, too. 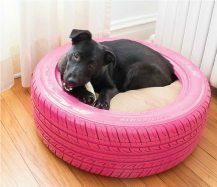 Give your pup a nice cozy tire bed that he can snuggle up in, and that looks great both inside and outside of the house. A tire, spray paint, stiff bristle brush, sticky felt feet, round pet bed. Get into the holiday spirit with this adorable snowman made from your old tires! A tire snowman is particularly great for areas that don’t get a lot of snow, but still want to build a snowman. You can make the project even more fun by involving your kids and having them help you decorate him. Tires, white spray paint, black paint, cardboard, scarf, twigs, gloves, hat, black pom poms, cotton sheet, plastic carrot. Impress your friends by making your own fire pit from old tire rims for your backyard. If you want to roast marshmallows or cook food, avoid using aluminum rims. Tire rim (not aluminum), fire bricks, metal grating. A small fish pond looks beautiful in the backyard and is simple to do. An old tire is the perfect size for a pond and adds a Zen-like feeling to your yard. Tire, garden foil, sand, gravel and pebbles, big stones, plants, a shovel, scroll saw, and a level. Yes, you can actually make shoes from your old tires. Follow this tutorial and walk around in sustainable shoes. While some types are easier to make than others, you will feel awesome about your shoes by the time you’ve finished this project. Tire, jig saw, Dremel, knife, barrel sander, nylon straps, buckles. Turn your old tires into a neat tire ball sculpture that is both affordable and eye-catching. Tire art is becoming popular and, if you get really good, you could even open up your own Etsy account and sell what you make. Three tires, corded drill, reciprocating saw blades, reciprocating saw, jig saw, band saw, sawhors- es, two 8-foot 2x4s and about 12 feet of 2×8s, and screws. Your kids will have a blast on this DIY tire teeter totter, and you can customize it to suit your child’s taste, whether it’s an animal or a spaceship. A tire, spray paint, saw, primer, 1×8 plank of wood, 2x4s, screws. Make an attractive looking garden hose holder from your tire rims. It’s super easy, doesn’t take many supplies to complete, and is a great addition to your hose. A tire rim, hose mount, spray paint, bolts. Impress your family and friends when they come over to visit by learning how to make beautiful balcony tire plant holders. These tire plant holders aren’t difficult to make, but look like they could have been purchased from a store. Tires, spray paint, cardboard, soil, plants, strong hooks, and a drill. You can create a fun seating tube for your child’s room instead of buying one from a store with this how-to. While many people use inner tubes for this seat, it can also be applied to tires. Don’t waste money on your child’s backyard playground when you can make a fun play- ground yourself. This couple spray painted their tires with fun colors before bolting them togeth- er for their kids. Tires, hammer, drill, spray paint, bolts, a washer, and nylon-lined nuts for each joint. These sturdy trugs made from old tires can be used to hold flowers or even heavy items such as tools. Trugs are great little gifts for the gardener in your life, and they are also a nice size for chil- dren to play with. A tire, chalk, straightedge, rope, scrub brush, bolt cutters, drill bits, a razor knife, power saw, pro- pane torch, and a flat-blade screwdriver. Put up your feet and relax with this awesome tire hammock. While the size may be more suitable for children, you might be able to get away with it if you’re small enough. A tire, rope, power saw, and a sturdy place to tie both ends of your hammock. This nice deck table made out of tires and glass is both chic and so simple to make. 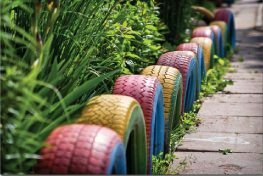 You can spray paint the tires to match your backyard décor, and add details to it if you want to get really cre- ative. Tires, spray paint, and a round piece of glass. Do your kids love climbing? If you have some sturdy trees in your backyard, your kids will love this tire climbing tower. Tires, spray paint, rope, Exacto knife. Those who have a lot of extra tires laying around can make them into steps for the backyard. All you need is some gravel or stones and to stack them on top of each other. These steps are great for areas that have consistently nice weather, but windy areas might need to reconsider. 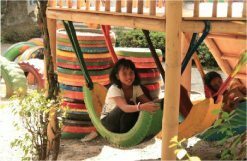 Plenty of school playgrounds have found ways to repurpose old tires into borders for their play areas by simply cutting them in half and securing them to the ground. You can do this in many different ways. Keep your hose organized by cutting the sidewall out of a tire and drilling drainage holes into it to keep water from accumulating in it. If you don’t drill holes, mosquitos can begin swarming inside where the water has failed to drain. Drill, saber saw (or sharp knife), and a tire. As you might have guessed, there are a lot of fun things you can do with old tires for your kids. This horse swing made from old tires will delight your little one for hours on end. Tires, bolts, nuts, washers, cover caps, wrenches, chalk, poster board, scissors, rope, and scotch tape. A tire garden stool can be made from old tires, is surprisingly comfy, and looks good in any setting. A tire, wooden board, a jig saw, acrylic paint, white gloves, sandpaper and a brush, pencil, a tape measurer, and a rope. Another fun addition to your child’s swing set is a tire ladder. If you already have a swing set, making a tire ladder from your old tires can be a fun and easy project for you. Tires, boards, long screws, power drill, and a tape measurer. A nice touch to any garage or man cave is this coffee table made from old tires. It does require dedication, but the finished project will leave you with pride from your hard efforts. Tires, acrylic enamel spray, paint and paintbrush, power drill, bolts, steel discs, sanding pad, degreasing solvent, tape measurer, wrench, and scissors. It is always a good idea to replace the tires when your tread wears down. However, many people don’t realize how many different ways there are to reuse and recycle their old car tires. Many of the items above make great gifts for friends, while others will put a smile on a child’s face. 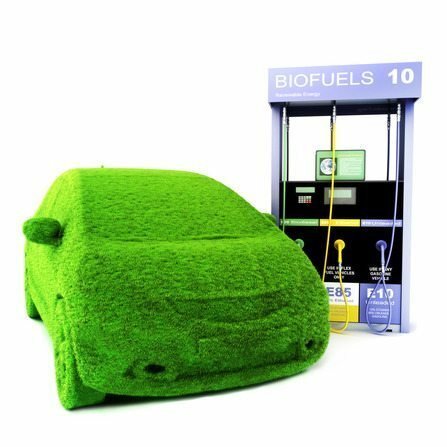 Putting your old tires to good use also benefits the environment, and being resourceful is something everyone should be proud of.